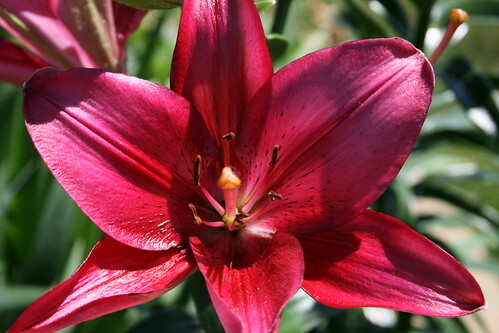 This lovely lily is growing in one of our flower beds. I just had to share the beauty of it. It's about 8 inches across and a lovely wine color. WOW!! I need one of those in my yard. Um...when I have a yard, I mean. ooh this is very pretty! Nice picture too! How beautiful! I love that picture! The blog URL is officially changed but I had to change it to www.chrisandamandajohnson.blogspot.com. They wouldn't allow the & symbol! Oops!